The biblical books of Daniel and Revelation were written approximately 2500 and 2000 years ago. They contained age-spanning prophecies of the future. Most of that future is now history, and the climax is approaching. This introductory presentation gives a very simple overview of the meaning of two parallel prophecies in Daniel, and how they connect with the prophecy of Revelation. When Daniel was younger, Nebuchadnezzar, the king of Babylon, had a dream. The vision was also given to Daniel. He saw a great metallic idol. It had a head of gold, chest and arms of silver, stomach and thighs of brass, and legs of iron. The iron continued through to the toes but was mingled with clay from the feet downwards. The idol was destroyed by a stone that fell upon its feet. The stone then grew into a large mountain, ultimately filling the earth. The story is given in the second chapter of Daniel. Towards the end of Daniel’s life, he saw a second vision which paralleled the meaning of the first. This was a vision of four fantastic beasts arising from the sea in succession (Daniel 7). Both these visions were interpreted as four great kingdoms or empires which would succeed each other. 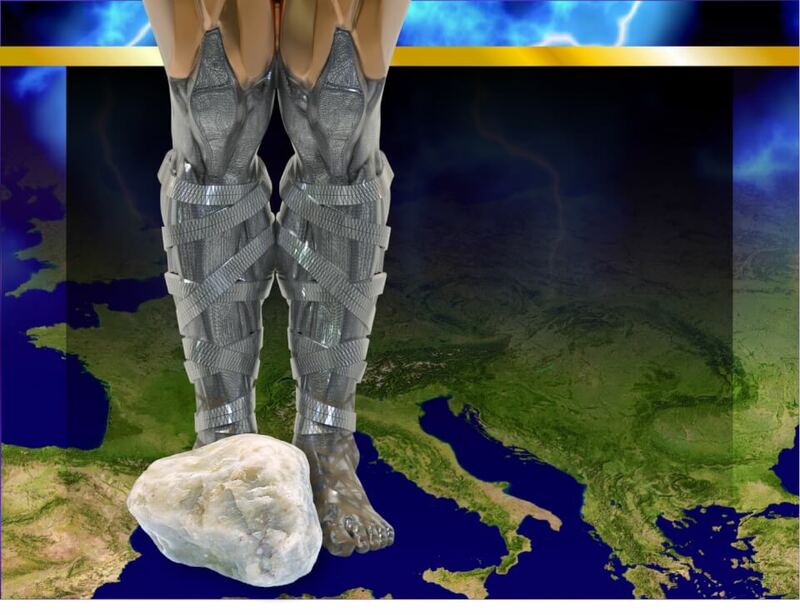 The legs of iron and feet of iron mixed with clay were counted as one iron kingdom, but having two phases. 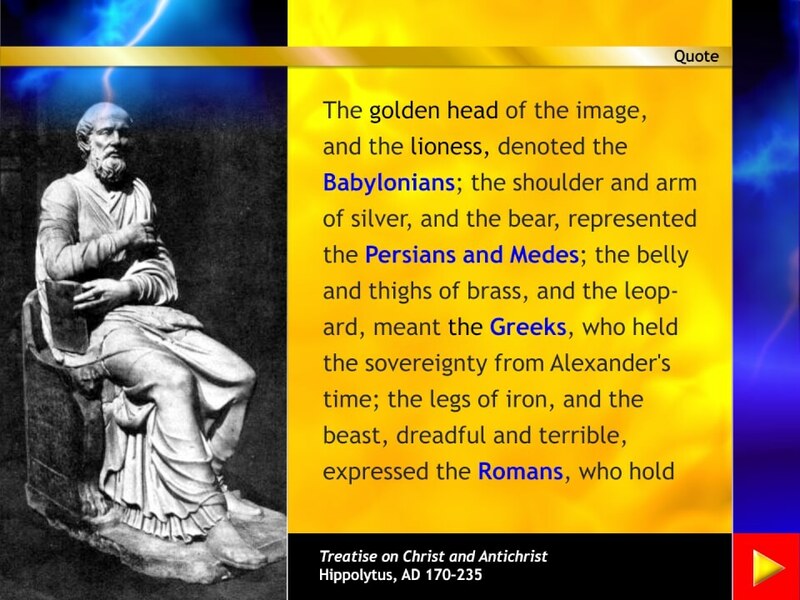 The first kingdom, the golden head, was identified with Nebuchadnezzar, representing the Babylonian Empire. In both visions, it is the fourth and last kingdom that is emphasised as the most dangerous. In Nebuchadnezzar’s dream, the metallic idol was destroyed by a stone, unshaped by man’s hand, that fell upon the feet of the image. This completely destroyed not only the feet of iron and clay, but the whole idol, reducing it to virtual powder and allowing it to be blown away by the wind. This prophecy is where we get the saying “feet of clay”. 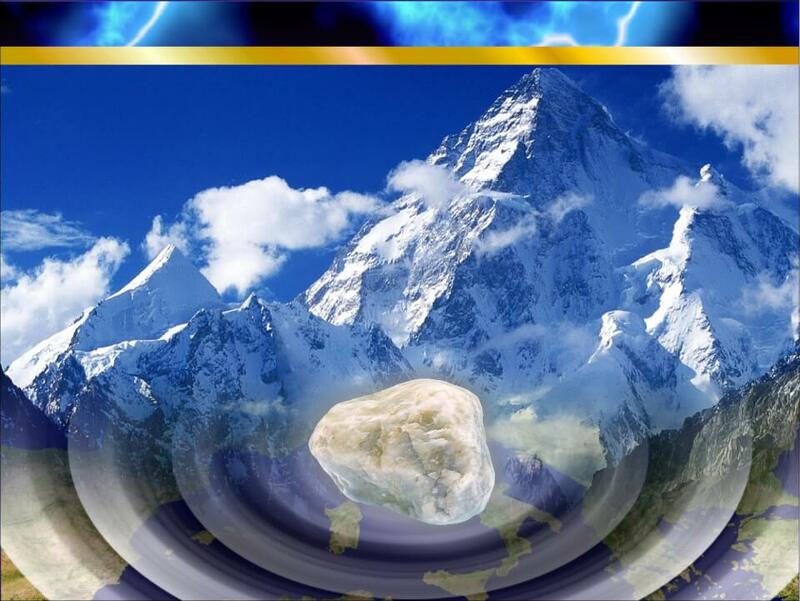 The stone then grew into a mountain, and ultimately filled the whole earth. The meaning of these visions has been known for a very long time. Here a quote from Hippolytus, shortly after the era of the early biblical church, explains the meaning of the parallel visions of Daniel. 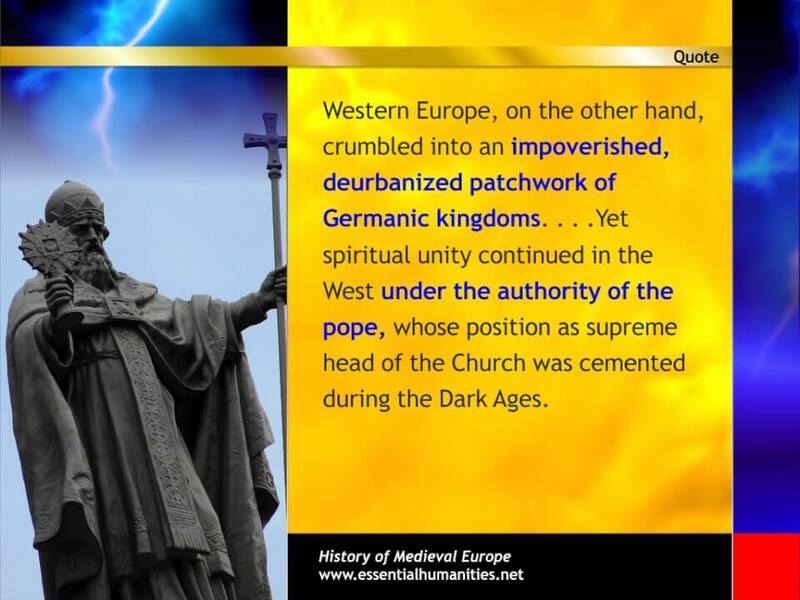 History shows that the conversion of Imperial Rome into a paganised and quickly corrupted form of Christianity set the scene for the rise of the papacy and a Roman Catholic Europe. The vision of Nebuchadnezzar’s image, or idol, is intended to be a very simplified grand chart of the future from the time of Daniel. It is a broad outline of history, given to the King of Babylon as he lay upon his bed and wondered what the future might hold. When we look at what actually happened in history we find that the Babylonian Empire was conquered by the empire of the Medes and Persians (the silver kingdom). Alexander the Great in turn conquered the Persian Empire and established the Grecian Empire (the brass kingdom). This divided and continued until overtaken by the Roman Empire (the iron kingdom). The iron of Rome’s influence continued in the mingled Romano-Germanic nations of Western Europe after the fall of the Western Roman Empire. 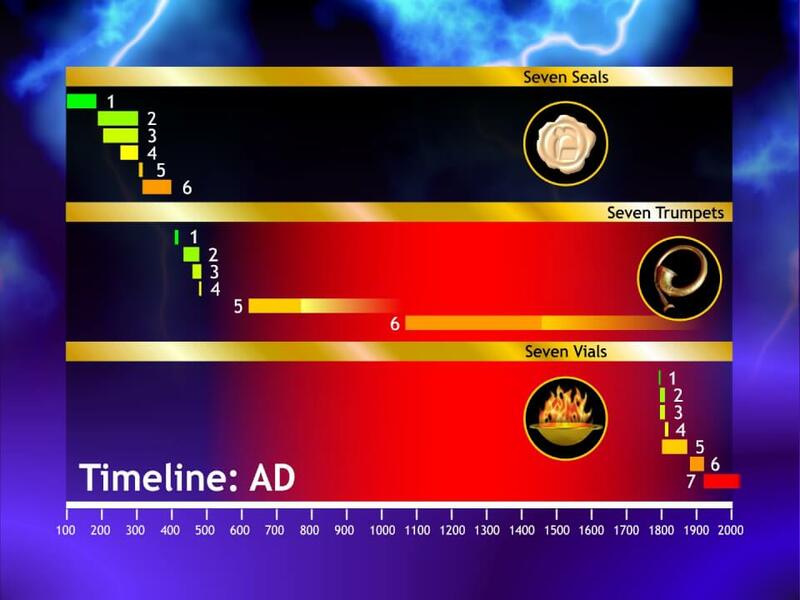 A look at the timeline shows that the first three empires occupied only about one fifth of the time between Daniel’s era and ours. 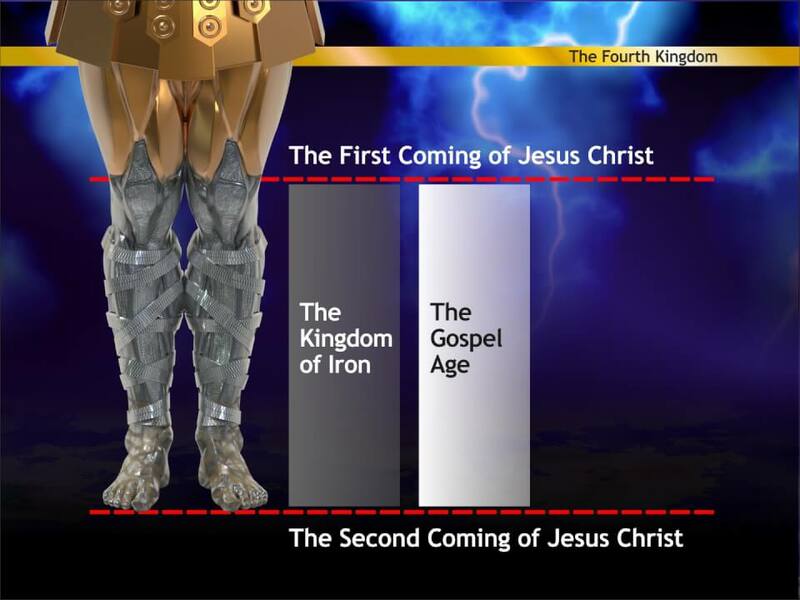 The fourth kingdom, the kingdom of iron, was to have two phases. In the second phase it was to become divided into ten nominal kingdoms and become mingled with other people. It was to continue in a partly strong, partly weak state as a result of the division and mingling. These kingdoms were to be dominated by a different type of king, one who was both a temporal power, and a religious one. When Imperial Rome divided into the Eastern and Western Empires it continued in an ever-weakening state in the east until Constantinople was finally surrounded and taken by the Islamic Ottoman Empire in AD1453. 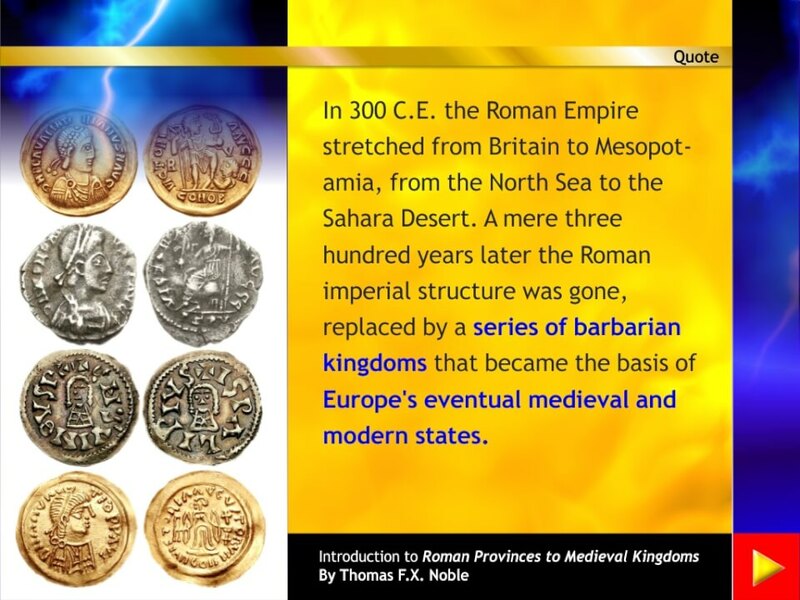 The original home of the Roman Empire in the west, however, was much earlier invaded and broken up into the nations of Europe, by the various Gothic and Hunnic peoples from the North. These mixed nations came under the sway of the papacy in Rome, which dominated them throughout the Dark Ages. The Kingdom of Iron and the kingdoms of Iron and Clay have the iron of Rome as their common thread. The Roman Empire at the time of the death of the emperor Theodosius in AD395. 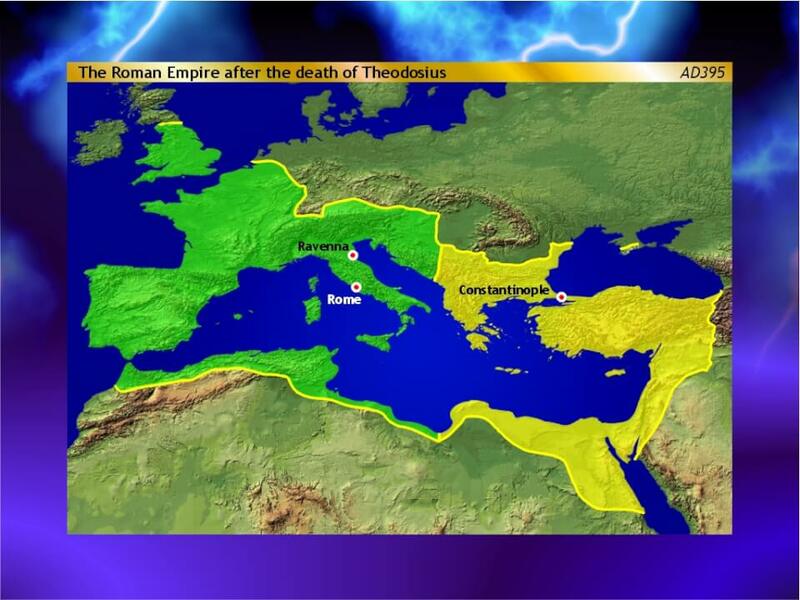 At Theodosius’ death in AD395, the empire was divided into the Eastern Roman Empire and the Western Roman Empire. Before the death of Theodosius, migrations and conquests of the Huns in the areas north of the Empire had put pressure on the borders. The movement of the Huns displaced the Gothic peoples north of the Empire. They in turn moved down into the Empire and mingled with its people. The central Roman Empire became occupied by the Goths, who established a de facto rule over the area, even though ostensibly ruled over by Theodosius from Constantinople. This relative calm continued until the death of Theodosius. Shortly after, the Goths poured into the Western Empire, and the breaking up of the Western Empire began. The Western Roman Empire was overrun by barbarian invasions – those of the Goths, the Vandals, and the Huns. This gave rise to the nations of Europe. 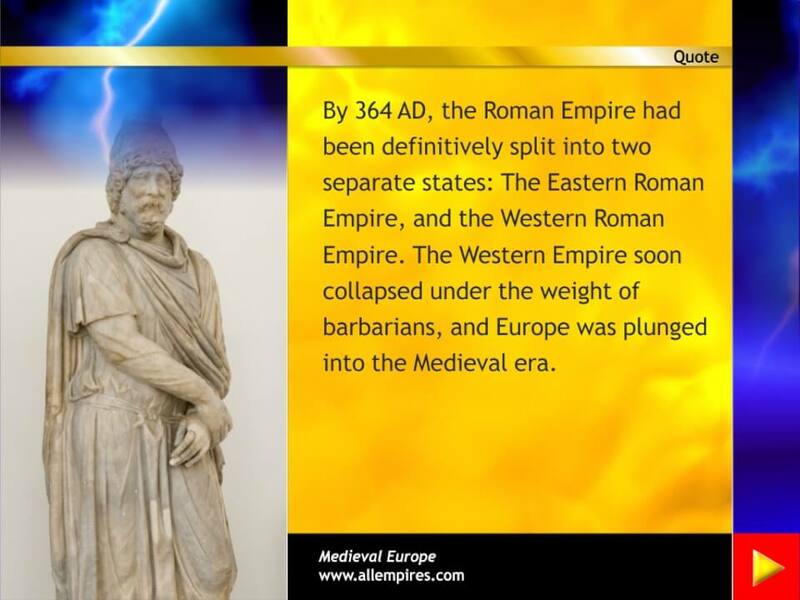 The Roman Empire broke up into a number of mingled Romano/Germanic kingdoms. The toes of the statue were partly iron and partly clay. 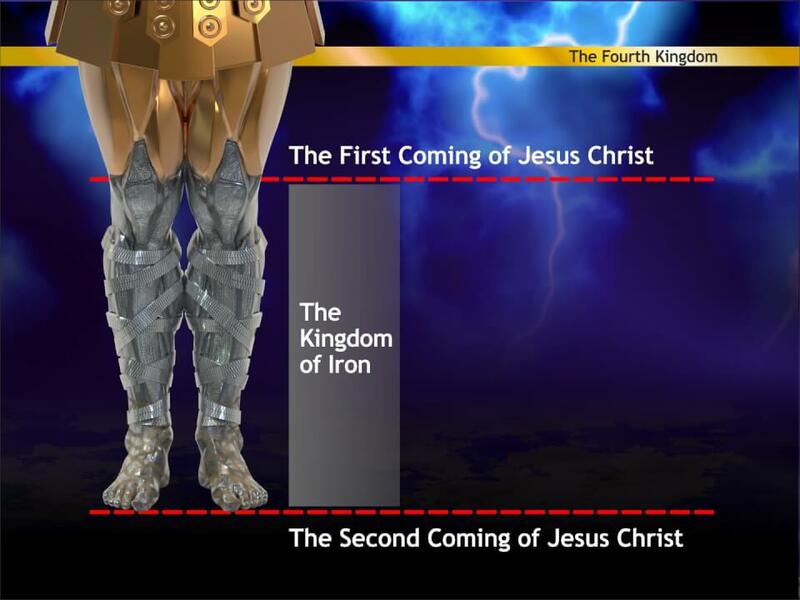 So the fourth kingdom will be partly strong like iron and partly weak like clay. You saw the iron mixed with clay, but iron and clay don’t completely mix together. In the same way the people of the fourth kingdom will be a mixture. They will not be united as one people. The Western Empire came to its end in AD476, and was broken up into the nominal ten kingdoms of Europe. While borders and countries have been in continual flux, that basic arrangement of partly strong, partly weak European nations and mingled people has continued ever since. As the Dark Ages descended upon Europe with the breakup of the Western Empire, Rome again rose to a long dominance in a new and different form under the papacy. God would eventually take away the dominion of Rome “to consume and to destroy it unto the end” (Daniel 7:26). While the hold of Rome and the papacy over the kingdoms of Western Europe was to be weakened and consumed, it would not be destroyed completely until the return of Jesus Christ. The consuming by the “spirit of his mouth”, or the Word of God, may be considered to have begun with the Reformation in the early 1500s. The political and temporal fortunes of Rome suffered irreparable damage in the French and European Revolutions of the 1800s. Europe has continued in flux and war since, always “partly strong and partly broken”, attempting to unify, but never succeeding for long. The various players, both religious and political, will remain in this state until the return of Jesus Christ. The book of Daniel itself records the overthrow of Babylon (the gold) by the Medo/Persian empire (the silver). 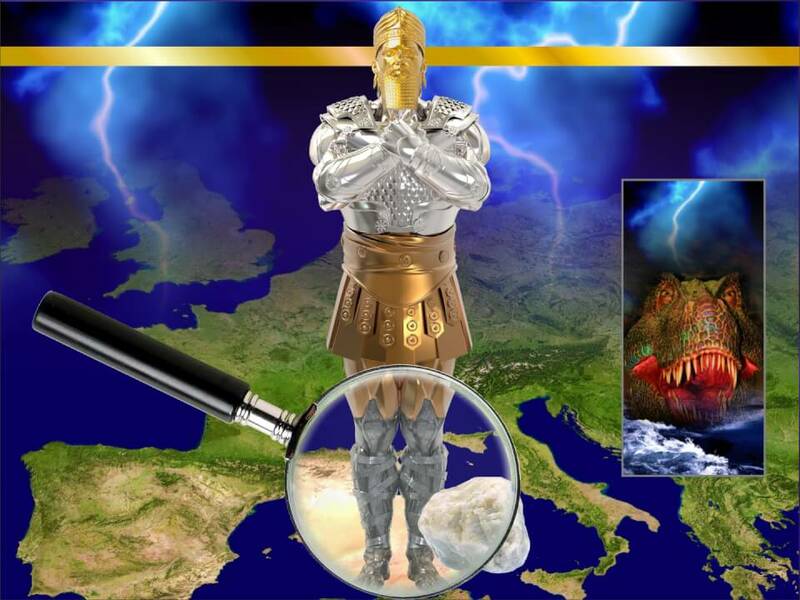 Daniel also records a vision that directly names the “King of Greece” (the brass) as the one who will overthrow the “Kings of Media and Persia”. The New Testament records the Roman Empire in power at the time of Jesus, after the power of Greece is overcome in turn. Determining where the brass completely gives way to the iron is instructive, and we will look at that in the next few slides. Claudius Ptolemy was a Greco-Roman mathematician and astronomer who died around AD168. 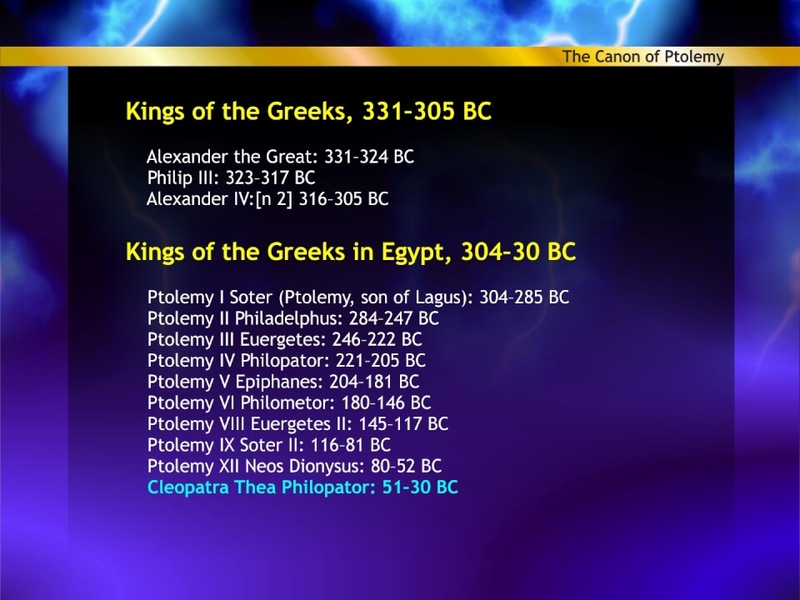 He preserved a list of kings from earlier sources that demonstrates the change of empires from 747 BC until his time. 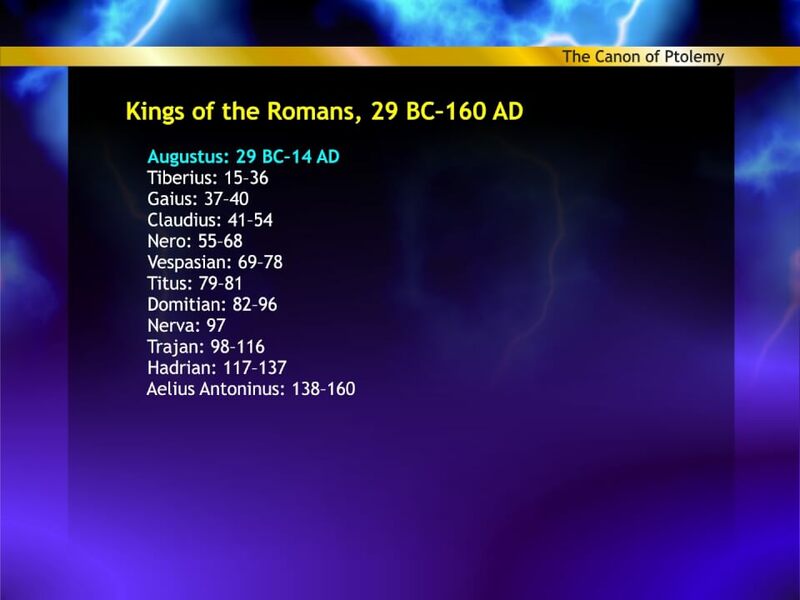 The Canon of Kings was a dated list of kings used by ancient astronomers as a convenient means to date astronomical phenomena, such as eclipses. The Canon was preserved by the astronomer Claudius Ptolemy, and is thus known sometimes as Ptolemy’s Canon. 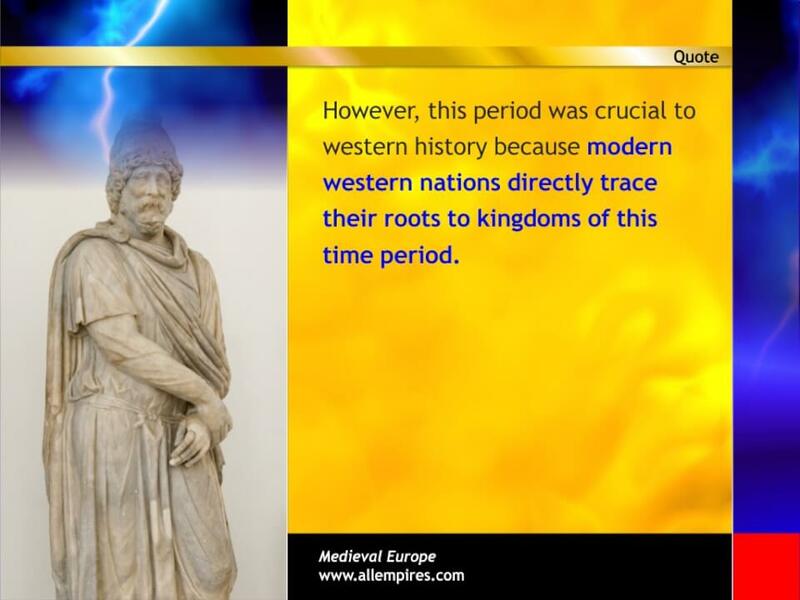 It is one of the most important bases for our knowledge of ancient chronology. 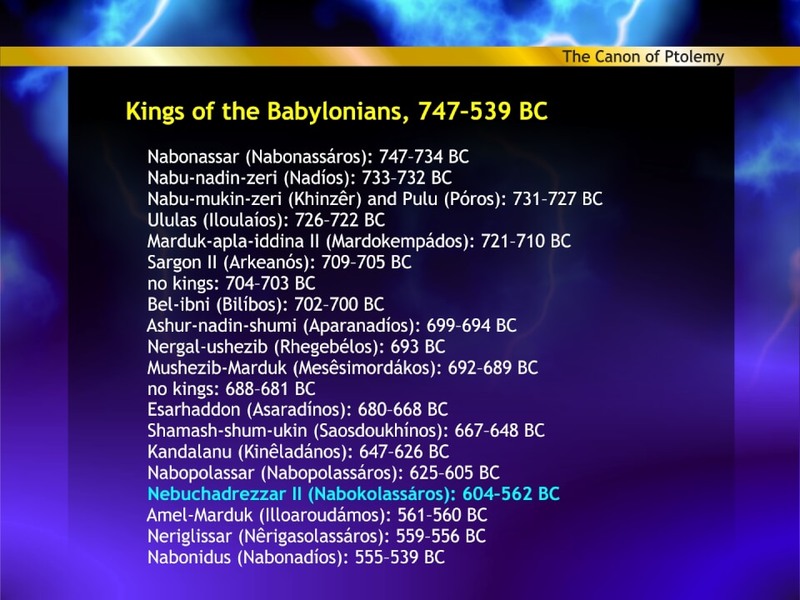 Beginning with the Babylonians, he lists the reigns of their kings until their overthrow by Persia. 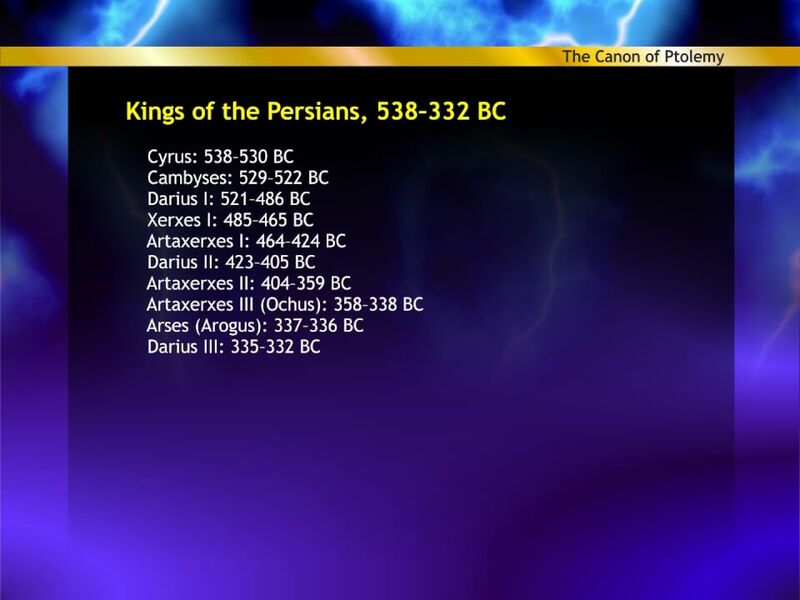 He then lists the Persian kings until the overthrow of their empire by Alexander the Great of Greece. After the death of Alexander, his Empire was broken up amongst his generals. Greece in turn was eventually overcome and swallowed by the Roman Empire. Greek rule continued in areas such as Syria and Egypt, but by the time of Julius Caesar, the last vestige of this rule existed only in Cleopatra in Egypt. With the defeat of Mark Antony and Cleopatra by Octavian, after Julius Caesar’s death, the brass of Daniel’s image came to a full end. Octavian renamed himself Augustus, declared himself an emperor, and established the Roman Empire. 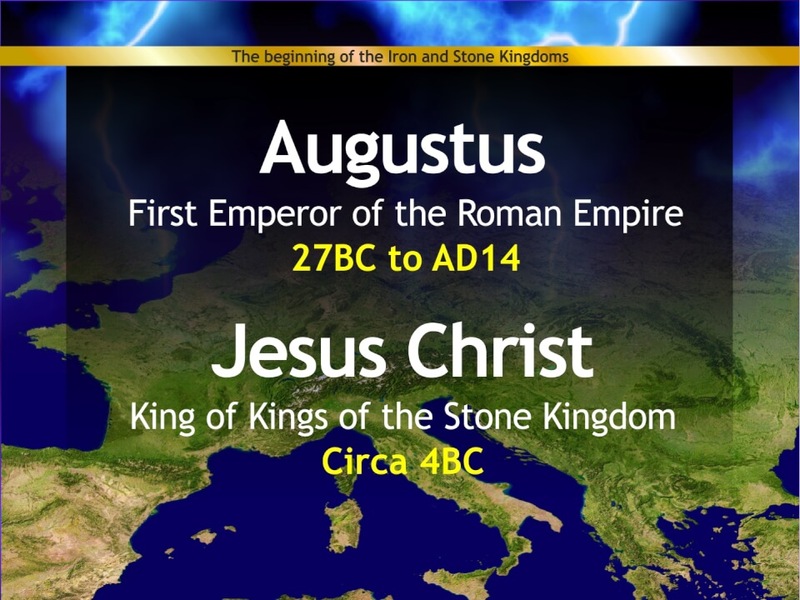 In a “coincidence” of history, Jesus Christ, destined to be the King of the eternal Stone Kingdom to come, was born in the reign of Augustus. 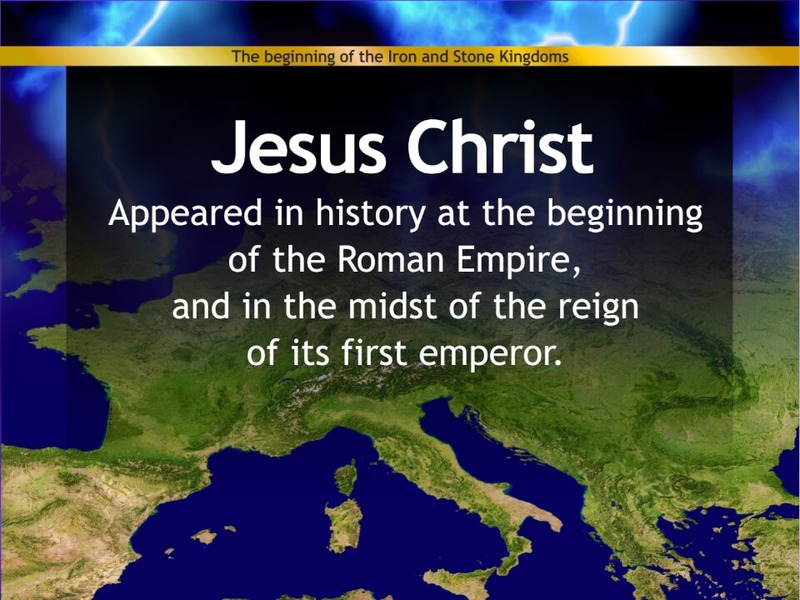 Jesus’ first coming coincided with the beginning of the Empire of Iron. 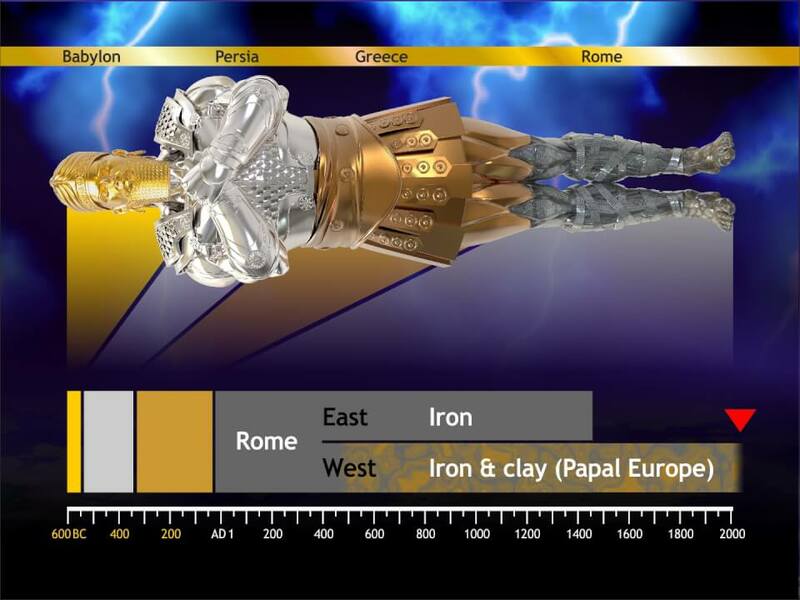 Christ’s second coming coincides with the end of the Iron Empire, in its Iron and Clay phase. 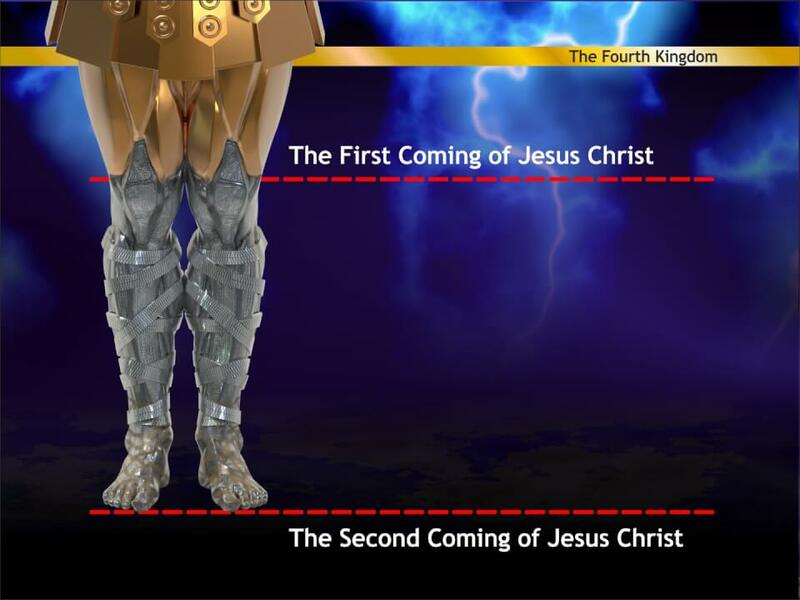 The era of this fourth kingdom then is bracketed by the two comings of Jesus Christ. This helps explain why the fourth kingdom in both Daniel’s visions was so important and so emphasised. The era is the final era of Iron – the last and most dangerous of the kingdoms of men before the eternal kingdom of God. 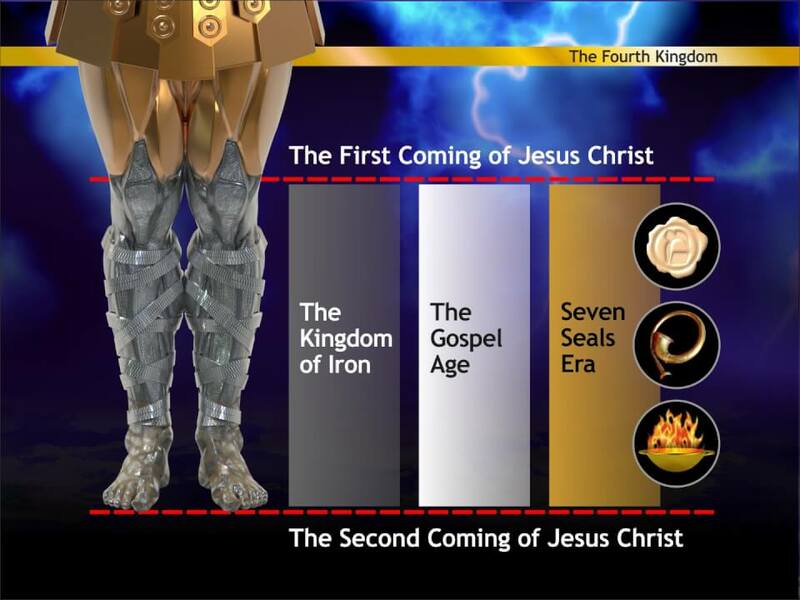 This era is also the Gospel Age, the New Testament age, in which the “gospel of the kingdom of God” is preached. This era contains both the worst of earth and the best of heaven so far. This era is also the subject of the book of Revelation. 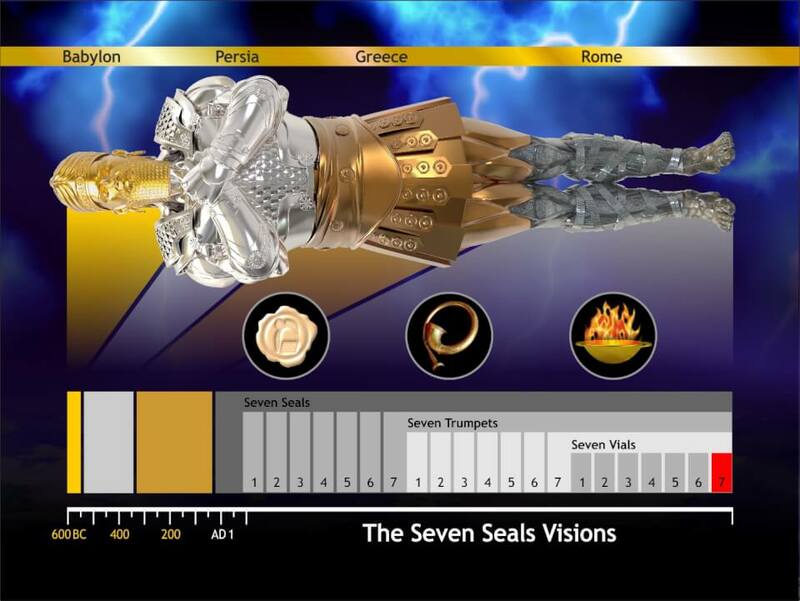 That book contains the prophecy of the Seven Seals, including the Seven Trumpets and Seven Vials – a trifold series of approximately 21 visions. It prophesies the history of the Iron, and Iron and Clay kingdoms, and reveals the ultimate triumph of the Stone kingdom over them. The Seven Seals visions, incorporating the Seven Trumpets visions, in turn incorporating the Seven Vials visions, give more detail on this the most long-lived and most hardened of the kingdoms of men. These visions were addressed to the church, who would live throughout this age, and continue in conflict with it. 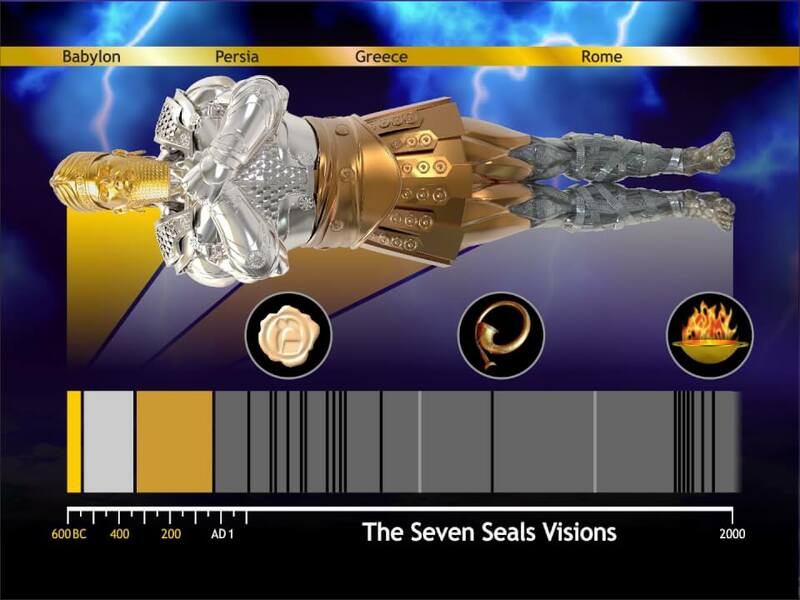 The Seven Seals visions are a series of visions describing the major events and eras of the pagan and papal Roman kingdoms. They outline the glory, the decline, and the fall of Rome. 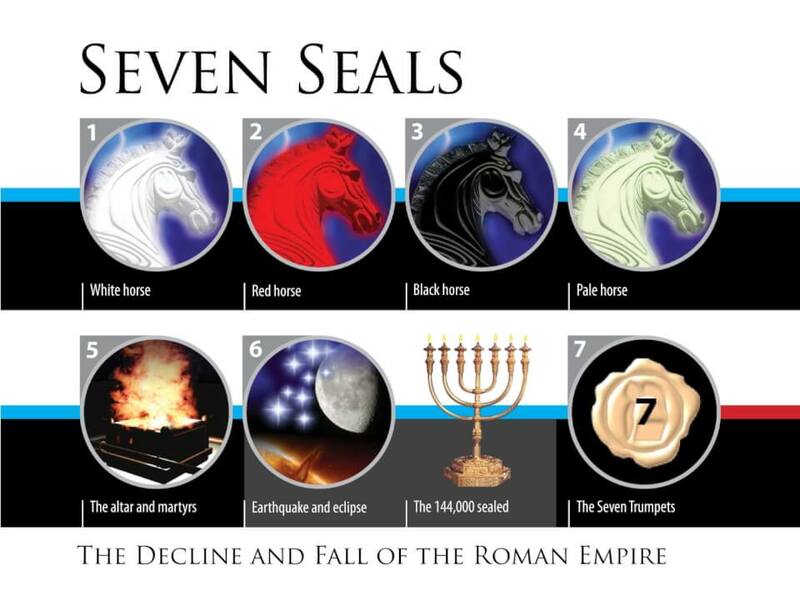 The Seventh Seal, describing the fall, is broken up further into the subheads of the Seven Trumpets and the Seven Vials visions, which give more detail on the fall of imperial Rome, and the fall of papal Rome. 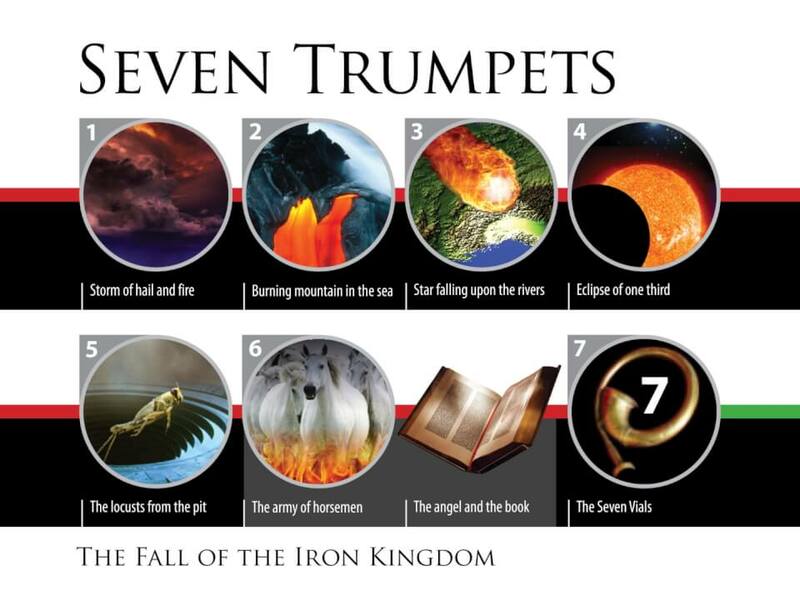 The Seven Trumpet visions, part of the Seventh Seal, describe the fall of the Roman Empire in the west and east, and the fall of papal Europe. They also describe the associated rise and fall of the Islamic Empires in the east. The Seventh Trumpet consists of a further series of visions called the Seven Vials, and deals particularly with the fall of papal Europe. 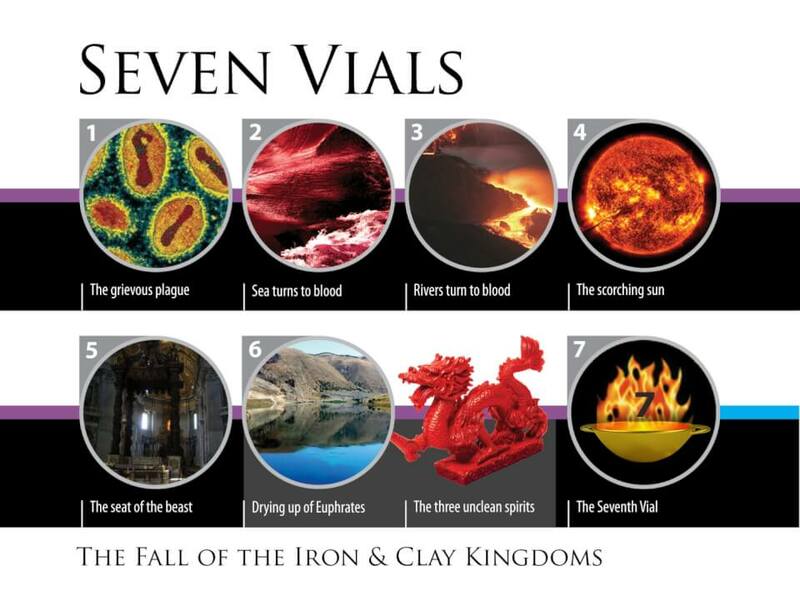 The Seven Vials describe the final judgments upon papal Europe and Rome, and the drying up of the Islamic Ottoman Empire. 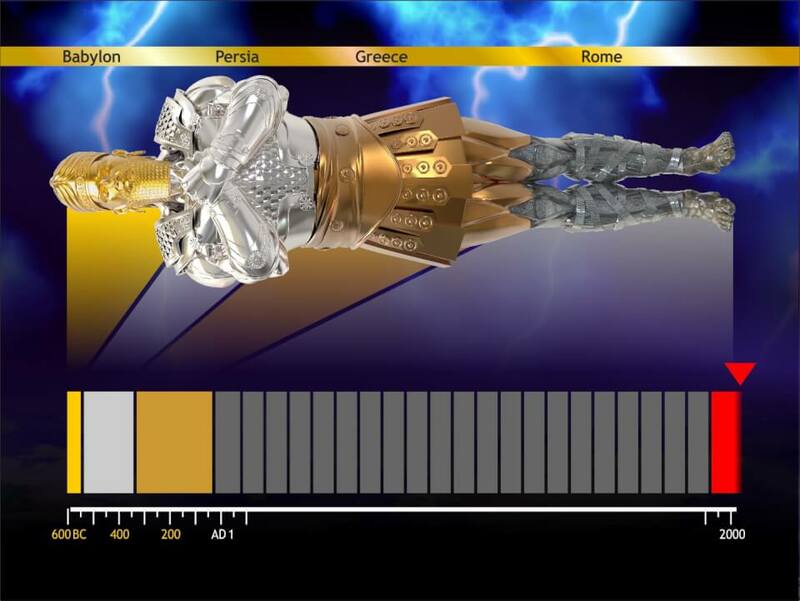 The climax comes in the Seventh Vial with the fall of spiritual “Babylon” (Rome), and the subsequent vision of the return of Jesus Christ as King of Kings, and Lord of Lords. His coming, represented by the fall of the Stone upon the feet of mingled iron and clay, brings final destruction upon the corrupted kingdoms of mankind. 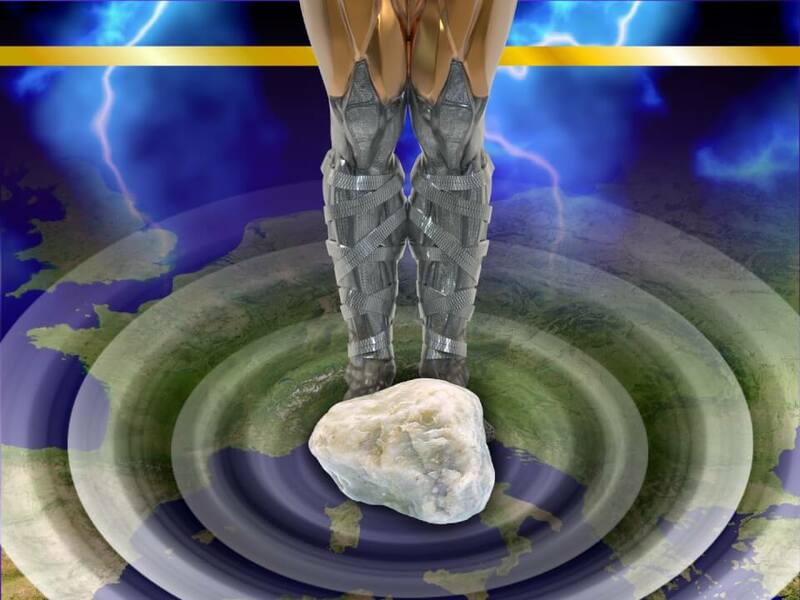 If we take a magnifying glass and place it over the iron legs and stone of Daniel’s image, we have a picture of what the prophecy of Revelation is about. 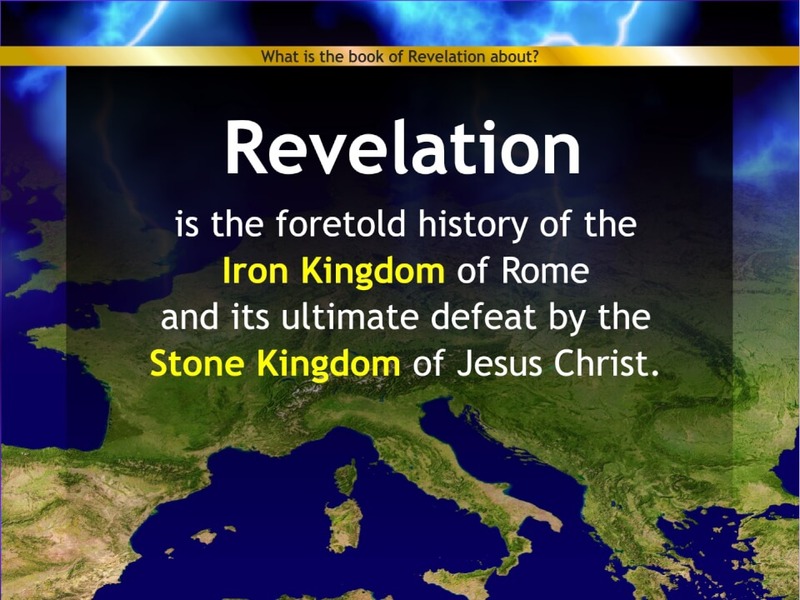 Revelation is the tale of two kingdoms – the Iron in both its phases, and the Stone. 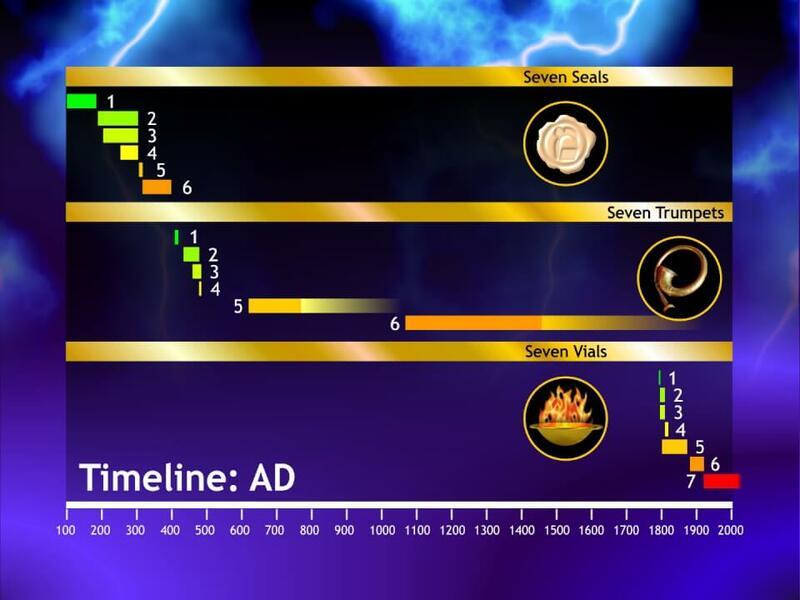 If we take a look again at the basic timeline of the four empires, we can see that Daniel’s prophecies gave a basic outline and timeframe, but without more detail being given about the fourth kingdom, we would have little guidance as to how long it would be before the coming of the fifth – the Stone. What God often does in prophecy is to give more detail as time goes on and necessity requires it. 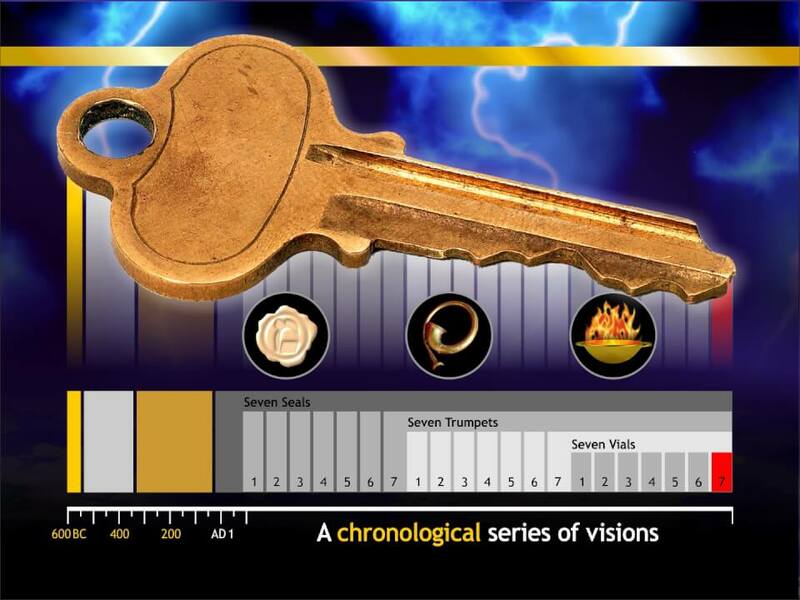 The series of approximately 21 visions in the book of Revelation, given at the beginning of the Iron kingdom, is intended to give us a basic timeframe of where we are in history. We can check off the fulfilled events in this last empire just as we have checked off the fulfilled empires that went before it. 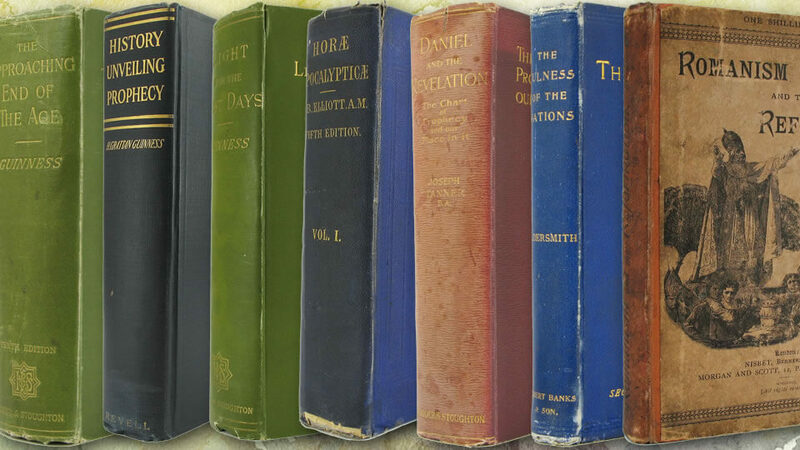 The gradual fulfillment of those visions has been traced throughout the New Testament age by many. If the visions have been traced accurately, we now unavoidably appear to be in the final scene – the Seventh Vial of the Seventh Trumpet of the Seventh Seal. Since history does not order itself into neat eras of the same length, the starting points of the various visions (represented by the black lines) look something more like the above. More intense flurries of activity take place with the rise and fall of empires, leaving relatively more stable eras in between. 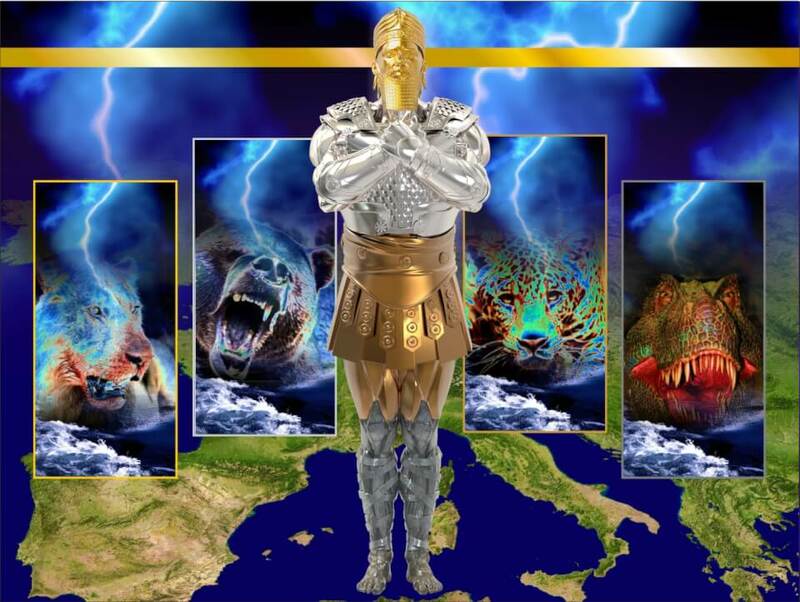 Daniel’s visions of the metallic idol and the four beasts are both interpreted as a chronological succession of empires. If we understand the subject matter of Revelation’s visions to concern the Iron legs of the image and the fourth fantastic beast, and we understand them to be in chronological order also, the interpretation is not only more logical, but more simple and more easily demonstrated. Not only do the interpretations have to fit the symbolism of the visions, they also have to do so in the right order. This is one of the great strengths of the “continual historicist” understanding. Like the cuttings on a key, we must have the right fit in the right place to unlock the meaning. The more numerous the cuttings, or more characters in a password, or more visions in the series, the less chance of a random unlocking, or fudged interpretation. History being in the past means the main events and important eras are already known. This makes it much easier to determine if we have the correct fit. 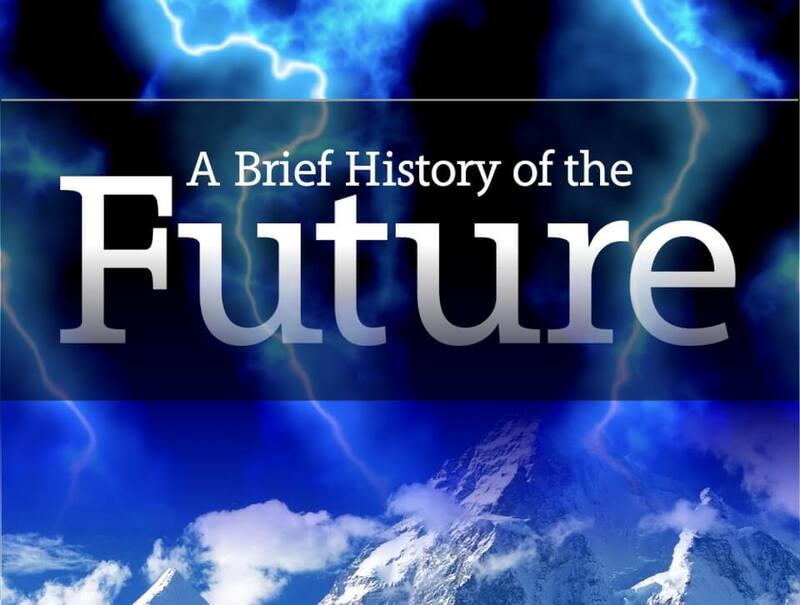 If we view a basic timeline of the events that have been proposed to fit the visions, we can see that they take us from the time Revelation was written, to the beginning of the last Vial in the era of the 20th century, and the great world wars near its beginning. The First Seal represents the peak and glory of Rome. Those after it outline its decline, and then its transformation from an overtly pagan Empire into one that was nominally Christian. The Seventh Seal describes Rome’s fall in the visions of the Trumpets and Vials. The Seven Trumpets outline the sudden barbarian waves of invasion in the Western Roman Empire, then the gradual extinction of the Eastern Empire in connection with the rise of Islam. They describe the Reformation and then, in the Seventh Trumpet, the fall of papal Rome under the sub-heading visions of the Seven Vials. The Seven Vials of God’s wrath on Catholic Europe begin in the era of the French and European revolutions of the late 1700s and 1800s, and continue through the loss of the Papal States in 1870, and drying up of the Ottoman Empire, into the First and Second World Wars and beyond. The red area corresponds to the rise and dominance of papal Rome and the Islamic empires throughout the Dark Ages. Both were destined to be gradually consumed and weakened before the end of the age. The extended eras of the Fifth and Sixth Trumpets in the east, and the simultaneous dominance of the Iron and Clay kingdoms in the west are the only visions to have definite prophetic timeframes included with them. A glance at the timeline shows this may have been necessary to confirm both their correct interpretation and their extended duration when compared with the other shorter visions. And when these things begin to come to pass, then look up, and lift up your heads; for your redemption draweth nigh. … So likewise ye, when ye see these things come to pass, know ye that the kingdom of God is nigh at hand. The Revelation of Jesus Christ was given by him to reveal, and his Spirit to show us “things to come”. God has not left his people without hope or a basic outline and timeframe of his plan. You can navigate through the slides more quickly using a mousewheel or keyboard arrow keys. Refresh the page to return to the first slide, and don’t forget you can reach the last slides quickly by moving backwards from the first.